In common with many other urban watercourses across the world, Manchester’s smaller rivers are today all but buried beneath the city centre. 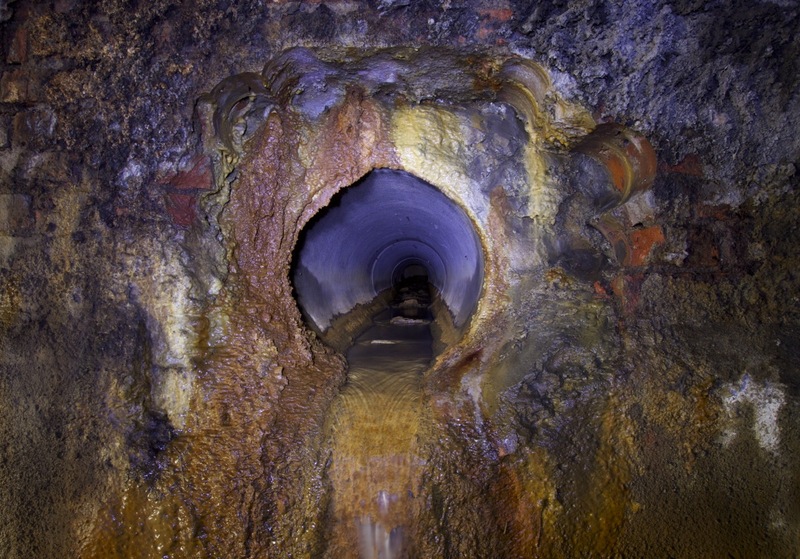 As Manchester rapidly expanded and industrialised in the nineteenth century, its once salubrious watercourses – the Irk, Tib and Medlock – became notorious as appalling foul-smelling and polluted streams (or, rather, open sewers). Unsurprisingly, by the turn of the twentieth century, the courses of these rivers were largely canalised or hidden beneath brick and stone culverts. 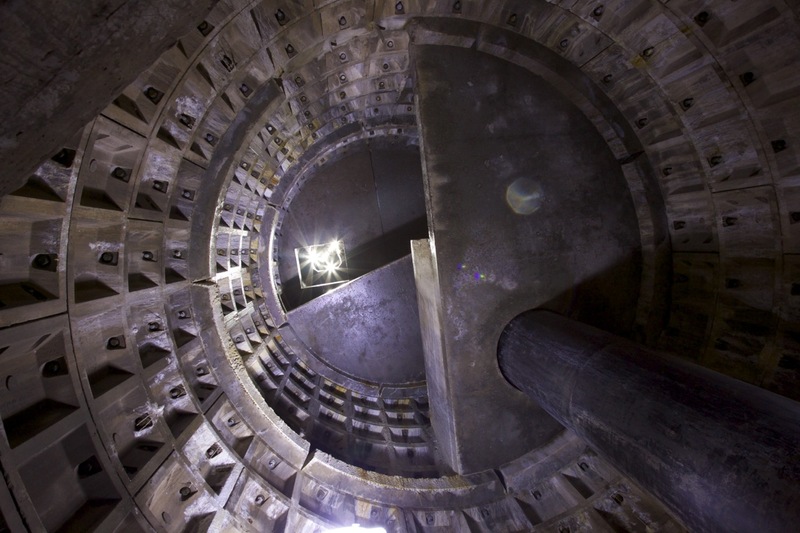 So, today, the Irk disappears beneath Victoria Station in a giant 1km culvert before joining the Irwell, the Tib has long since become a sewer, while the Medlock snakes almost shamefaced through the city centre in a series of culverts before emptying into the Irwell at Castlefield. Even in suburban areas, the Medlock was long ago forced underground, most notably in a 600m culvert under what is now the car park of the Manchester City football stadium straddling Miles Platting and Clayton. 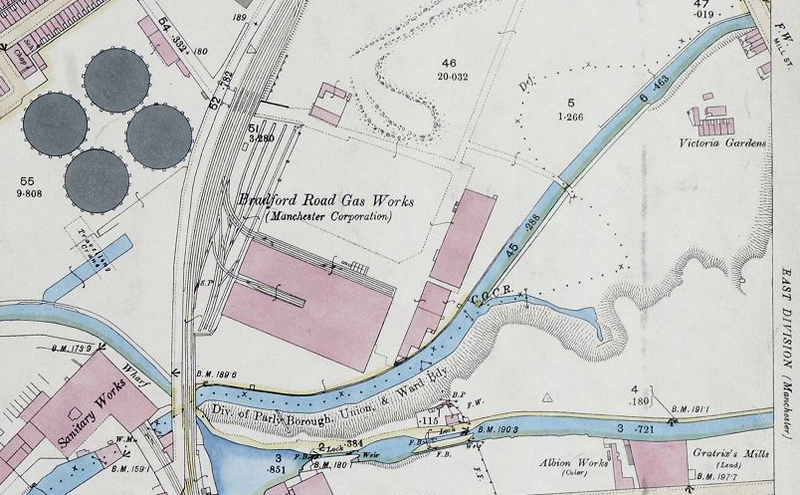 When Joseph Adshead made his extraordinarily detailed maps of Manchester in 1851, the Medlock was depicted meandering across open fields in Miles Platting; while the Ordnance Survey map of 1893 showed the river still open but straightened in its course (1). Culverting of this section of the Medlock began in 1905 and was complete by 1909. At the same time, a whole section of the river upstream in Philips Park was canalised with millions of red Accrington bricks, forming a walled bank, the fast-flowing water carried in an artificial channel. Today, Manchester’s ‘red’ river is being restored to its ‘natural’ state, the bricks being slowly removed in an attempt to rehabilitate the watercourse in Philips Park. 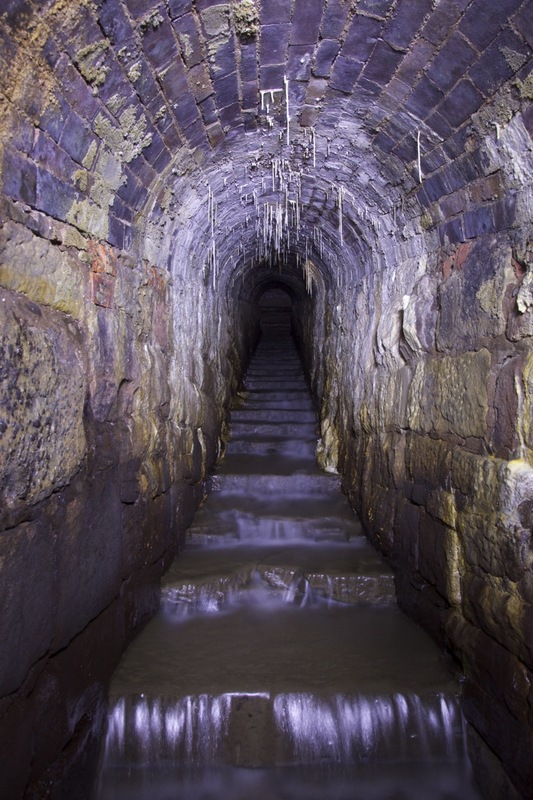 It remains to be seen whether the tunnelled section of the river Medlock will remain in place – for it is here that one gets the strongest sense of a shackled watercourse, banished underground. 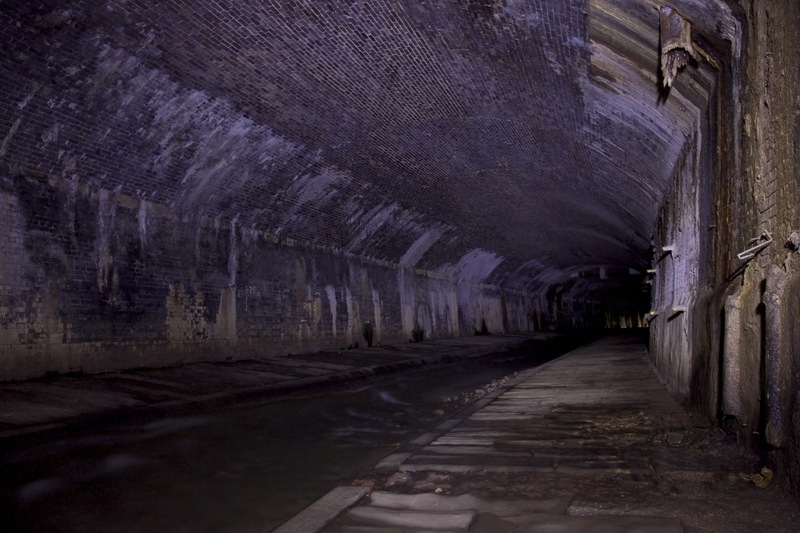 Despite being relatively easy to access (a hop over a fence and a short wade through the water), the culvert is nevertheless a forbidding place: walking into pitch darkness goes against all natural instincts and the sound of running water is magnified by the cavernous brick tunnel (2 & 3). The Medlock’s waters may be technically ‘clean’, but, over the years and together with many smaller overflows that line the tunnel, they have created a fantastic array of shapes and colours on the brickwork, a petrified miasma that is at once beautiful and repellent (4). There are other wonders here too: an inspection chamber that rises 30 ft to the surface in a series of concrete platforms that resemble the startling modernist geometries of Brutalism (5); and, further down, a resolutely Victorian series of steps down which tumble water from the Ashton Canal, which lies above the culvert (6). More unsettling are the remains of tombstones within the Medlock’s waters: flushed downstream in a calamitous flood of 1872 when the river burst its banks and inundated the cemetery next to Philips Park, carrying off dozens of corpses and headstones. 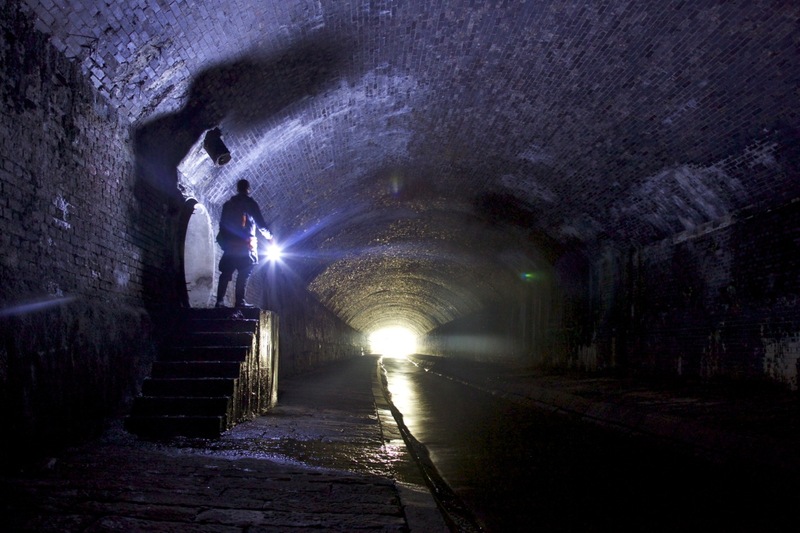 The strange coming together of the ultra modern, Victorian gothic and the downright morbid in the Medlock culvert characterises many urban underground spaces and is no doubt why they are so appealing to urban explorers. Indeed, the rich interweaving of contradictory elements witnessed in the Medlock culvert is exactly what is missing from the rhetoric that surrounds the current project to restore the river to its ‘natural’ state, which seems to speak of the river in a way that divorces it from the (industrial) history of the city. 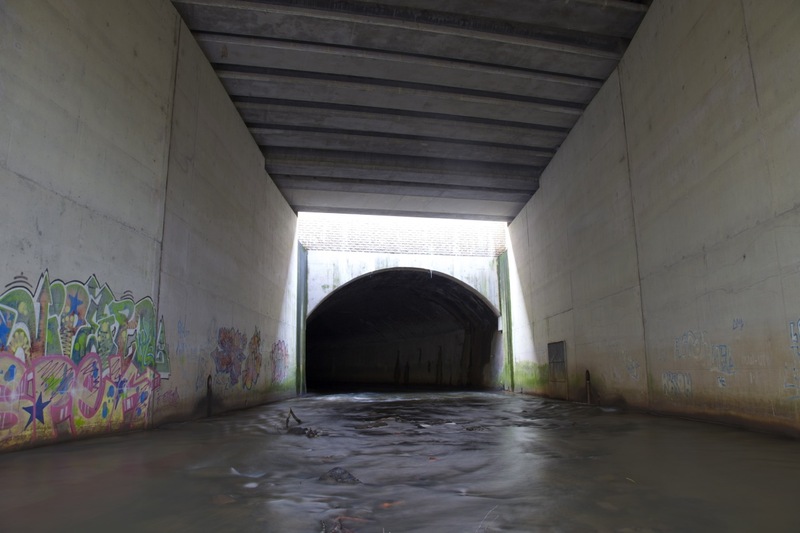 Perhaps the real imaginative force of the Medlock (and all urban rivers) lies at the point where it meets human attempts to control its power – producing in structures like the Medlock culvert a fecund melding of human and non-human forces. A great posting Paul – the quality / depth of research, the text and the pictures. Manchester was the nearest city to where I grew up and it always stirs the old heart to read about its lesser known byways. Thanks Ian. It’s good to know that my responses to my ‘adopted’ city also resonate with Manchester’s (near) natives! Fascinating, Paul. I love reading about these hidden watercourses and the melding of human and non-human forces. Thanks Graham and Laurence. Always good to hear that my posts are of interest to you. I wonder if this article sheds some light on something my dad – now 84 – told me about when he used to live in Miles Platting as a child. He lived on Bedford Street (now Beckford Street) and was always told as a small child to never lift out the wooden boards at the back of a cupboard in the hall as there was access to a tunnel that led all the way to Manchester, a fact he still swears is true to this day. Wow great information ! Really well written, brilliant photographs ! I live on tib st (so was a little sad to find out the river tib isn’t much more that sewer) but also I’m a bit of amateur mancunian historian . I enjoyed this article a great deal ! Thanks James for your kind words! There’s also another section of the Medlock culvert further east in Phillips’ Park. It’s also culverted under most of the city centre, although this was done later. Does anyone know if access to the red bricks is prohibited? ?